Making a good impression on a new prospective client can be challenging, especially if you have only a few minutes to build rapport. 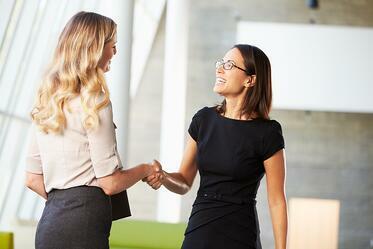 Typically, an initial meeting begins with small talk. When it’s too generic (“can you believe this weather?”), it doesn’t create a meaningful connection. When it’s too intimate (“have you considered working elsewhere?”), it can be off-putting. Most of us try to get through the perfunctory chitchat so we can get down to business. But that creates a weak foundation of trust, which in turn limits our ability to ask probing questions and learn all we can about the client’s problems. This begs the question: What do you say at the beginning of the meeting so that it ends well? There are plenty of communication techniques that can be helpful in this regard (mirroring body language, finding commonalities, asking open-ended questions, active listening, validating the other person’s point of view), but they can come across as manipulative if executed poorly. For example, if you are mirroring the other person’s body language in the hopes that they start to think, “oh look, our legs are crossed in the same way—we must have a lot in common” it is just as likely that your attention on mirroring is making you self-conscious about your own body language. You’re better off focusing on creating an authentic connection with the prospect. What you say or do is less important than the state of being you’re in during the meeting. If you are relaxed and attentive, they will sense it and begin to respond in kind. It’s very difficult to demonstrate genuine interest in another person. It’s far more effective to simply be interested. Building a meaningful rapport requires that you let down your guard. So ask yourself, can you set aside your agenda at the beginning of the meeting and bring the same warmth and sincerity you would extend to an old friend, or are you just being nice to your prospect as a means to an end? Only you can answer the question, but don’t fool yourself into thinking that your prospect can’t tell the difference.